Learn more about Dr. Laske! We Take Pride In Being An Extraordinary Office, Providing Quality Healthcare In A Family-Like Atmosphere. 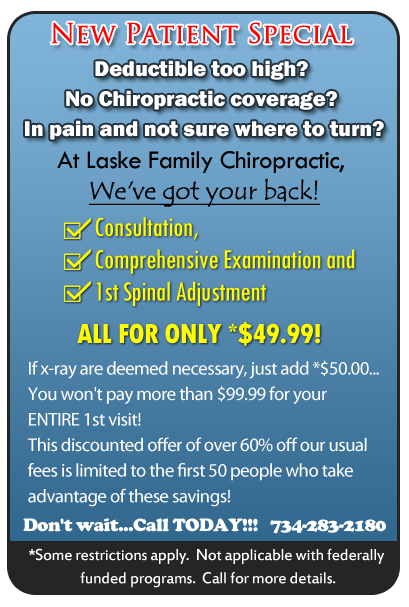 At LASKE FAMILY CHIROPRACTIC, We Take Care Of EVERYONE: From Children To Seniors, And From Athletes to Accidents, We Strive To Provide Natural Healthcare Solutions To Your Problems. Whatever Your Problem May Be, We Have Options For You That DON'T Involve Drugs Or Surgery. We Focus On Not Just Getting You Feeling Better, But More Importantly, FIXING YOUR PROBLEMS, So That Your Symptoms Don't Return Again And Again. We Are Located In Taylor, MI Just East Of I-75, In A Location That Has Been Serving The Community For Over 40 Years. So Whether You're Just "SICK AND TIRED" Or You Have Specific Problems, We Look Forward To Helping You!!! !